Start8 is the world’s most popular and stable Windows 8 start menu which brings the old Windows 7-style Start Menu for Windows 8. It is a more enhanced start menu for Windows 8 where you can pin modern applications. You can boot directly to the Windows 8 desktop. You could quickly access your applications, devices, music, videos and documents with Start8 as you did with Windows 7’s Start Menu. The new version 1.31 includes added bundled language files for Windows 8.1, DisplayFusion fixes, hid the advanced option when closing a metro app, and other unspecified changes. The installation asks whether you favor the Windows 8 Metro-style or the original Windows 7-style Start Menu. You can customize a few options like style, configure, and control of Start8. With the return of Windows 7-style Start Menu with Windows 8 enhancements, you can access to shutdown, devices, music, documents, and videos with just one-click. 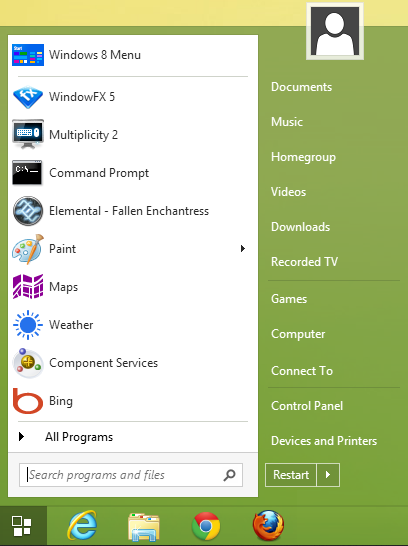 You can search for Windows 8 apps, ping desktop and metro app to the start menu. A unified search for apps, settings and files is added. You can boot directly to the Windows 8 desktop. A “Jump List” feature is also included in Start8. A Clean, streamlined user interface improves Start8’s usability where you can access Windows 8 Start screen from the Start8 menu itself. You can disable all Windows 8 hot corners when at the desktop and automatically go the desktop when you sign in. 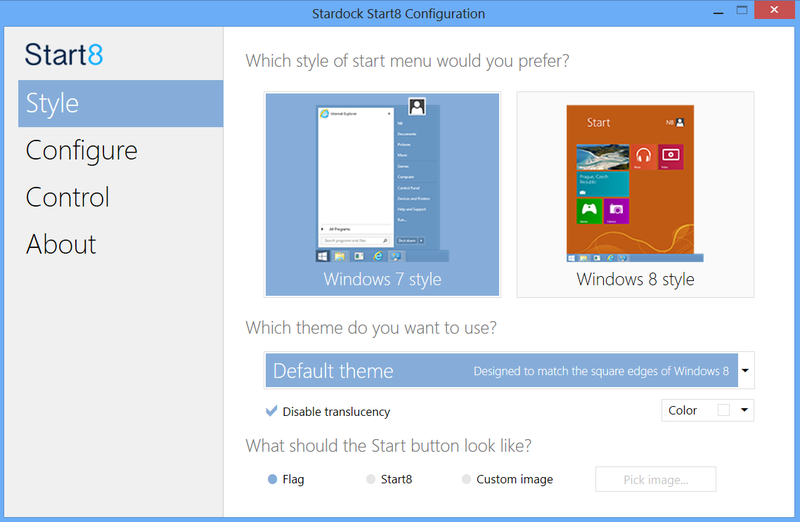 The configuration of Start8 made life easy where you can customize what would the user like to see on the menu, such as large icons, recently used applications, open submenus on mouseover, and highlight newly installed applications. You can customize the shortcuts you want on the right-hand side like Administrative tools, control panel, connect to, default programs, etc. On the other-side, Start8 is limited to 30 days, which will disappoint many Windows 8 users. However, the 30-day trial version gives you full features to use and customize. The full version can be purchased for $4.99.